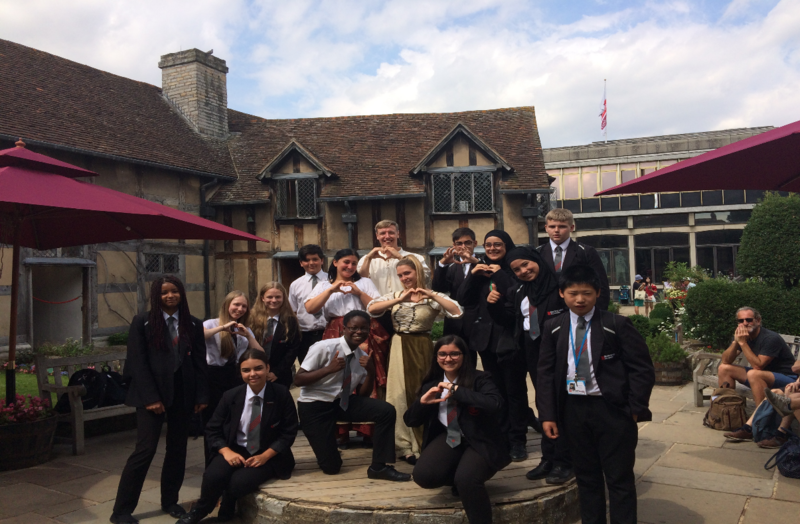 Here, a group of Smith’s Wood Academy students share their thoughts and experiences of a trip to Shakespeare’s town. Did you know that Shakespeare’s family had their best bed but never slept in it? Did you know that Shakespeare’s Globe theatre had to compete with bear baiting for the audience? Did you know that in Jacobean time the north of London was considered a rather insalubrious * area, that harboured pubs, places of violent entertainment and well… theatres? We did not either, until we went to Stratford-upon-Avon to explore the life of William Shakespeare. The group was treated to live recitals on request. We experienced the agony of Macbeth in his soliloquy ‘Tomorrow, and tomorrow, and tomorrow’, where the actor showed Macbeth’s suffering as intense and unbearable. Then, the uncanny three witches (OK, there were only two actresses!) plotting their ‘toil and trouble’ and finally the renowned balcony scene from Romeo and Juliet. In the rush of school pressure, there is often little time for reflection, but it is sometimes relaxing to pause occasionally to reflect on Shakespeare’s genius and devour our lunches by the river. Visiting Shakespeare’s birthplace, the grammar school he once attended (and no, it was not the shop! ), the RSC theatre, finally the church, and his grave was an interesting experience. Mohammed (yr10) thinks that ‘we need to open such trips to more students’ and encourage learning outside the classroom. Bring on Shakespeare!